Cloud Technology, that’s the technology revolutionizing the smartphone and device ecosystem every day. As we all know the benefits of using a cloud server for backups and fewer storage problems makes us go gaga for it but the integration of cloud in a smartphone file manager is something unique. 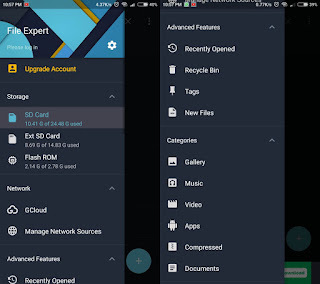 An expert file manager is the one application that keeps your phone going great, and if you own an Android device, then you must’ve been familiar with the importance of a file manager. Today I have an incredible File Manager or Expert that is already creating a buzz in the Play Store. So, let’s get started with the review of the GMobile’s File Expert. The app is available for both Android and iOS devices. As you all know the functions of a file manager and how it works so I wouldn’t stress on the basics. Moreover, File Expert has been providing much more than standard file manager application. With over 5 million downloads in the Play Store, the app is giving a cut throat competition to the renounced ES File Explorer. With the File Expert, you would be privileged to manage all your music files, photos, videos, APKs, PDFs, documents and much more. So, without any further blabbering, let’s start the with all the downloading and stuff. 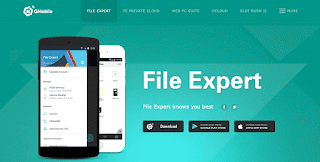 To get the taste of all the great features and stuff, you’ll need to download the File Expert for your respective device. For Android users, the app is available for devices with 4.1 or up and only takes approximately 4-5 Mb of space. You can download the app free, and it is also available for iPhones, and you can download it from the official App Store. To be honest, it is the simplest and user-friendly application I’ve used in any category, regardless of all the power packed features that it offers to the users. File Expert has been crafted with the latest Material Design making all the features more visual and adaptive. The interface has a grid-based layout with transitions and responsive animations that make it more modern and gorgeous regarding looks and design. The users are also entitled to choose and customize between different themes in accordance to their choice. Some inbuilt themes are also present in the app with an another feature to work in multiple tabs simultaneously. It makes the processes easier and faster. The App managers allow the users to easily backup, share and uninstall multiple files like media, documents and most primarily apps in bulk mode. The dashboard hosts all the features in the slide out Navigation and displays all the files and folders in the storage – internal and external both. All in All, it gives you a root access to all your files at one place. Private Cloud & Video Player: - The has provided a private cloud storage for every user with privacy restrictions. Upload your private files, media, and documents. You can also access and play the videos directly from the cloud via a Dedicate Cloud Player. Speed & Management: - One thing that took my attention was the accelerated speed and multitasking capabilities. Copying few videos of worth 1-1.5 GBs took only around a minute, with the rate of over 15mb/s. You can carry out all the basic cut, copy, move, rename and share like options within a few seconds. With the latest material design interface, all the storage lists, tools, and other features are compiled in a slide out Navigation Menu. There is also a Floating button to create or manage new tasks and processes. Storage Manager & Cloud Support: - The one thing that made the app stand out is the seamless cloud integration. So, you can easily manage all the internal, external storages as well as the cloud storages like Google Drive, Dropbox, One Drive and much more. Wireless Mode: - The latest feature of the File Expert allows the user to manage his smartphone’s files and storage with a PC over WiFi connection. You can also print multiple files and documents like PDF, TXT, etc. wirelessly. Multiple Language Support: - This File Manager supports over 20 languages for all the users worldwide. You can choose between English, Hindi, Russian, Thai, Spanish, Chinese, Polish, Korean, Arabic, Italian, Japanese, Indonesian, French, Turkish, Portuguese Bengali, and Dutch. 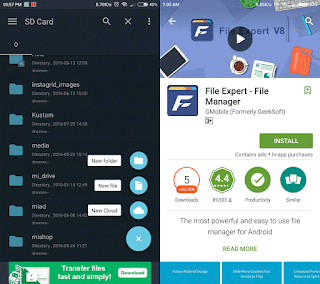 So, this was my take on GMobile’s fantastic File Expert App. It is an excellent file manager application for both Android Smartphones & iPhones. The app is free to download, and you can even go for the premium version with more enhanced and pro versions. Do share your thoughts and let me know for any query. Cheers!